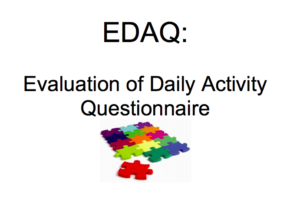 The Evaluation of Daily Activity Questionnaire (EDAQ) is a self-report outcome measure, which people complete at home in their own time and then return to the clinician/ researcher. It has been validated for use with people with arthritis and musculoskeletal conditions. It can be used for clinical, audit and research purposes. It includes three parts. Part 1 consists of 10 numeric rating scales evaluating aspects of body functions (e.g. pain, fatigue, movement limitations). Part 2 consists of 14 domains assessing activity and participation abilities/ restrictions with and without the use of ergonomic approaches. Part 3 (optional) is about assistive device use. It is available in two forms: parts 1 to 3 and Parts 1 and 2 only. 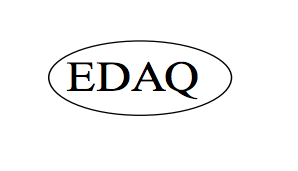 Usually, the EDAQ parts 1 and 2 is used for most clinical and research purposes. The updated EDAQ Manual v2 (2016) explains how to use and score the EDAQ, with scoring examples. Rasch Transformation Tables are available in the EDAQ Manual v2 Supplements 1 and 2. Copyright: For commercial use, electronic copy or queries, contact the lead author: profalisonhammond@btinternet.com or a.hammond@salford.ac.uk. No part of the EDAQ or EDAQ manual can be modified without prior permission of the lead author.